American family, tracing its descent from Benjamin Nones of Philadelphia, who lived at the end of the eighteenth century. American soldier. A native of Bordeaux, he emigrated to Philadelphia about 1777, and at once took up arms on behalf of the colonies, serving throughout the Revolutionary war with bravery and distinction. He served as a volunteer in Captain Verdier's regiment under Count Pulaski during the siege of Savannah, and on Dec. 15, 1779, he received a certificate for gallant conduct on the field of battle. After the war he engaged in the brokerage business with Haym Solomon. He was naturalized Oct. 9, 1784. In 1791 Nones was elected president (parnas) of the Congregation Mickvé Israel, and held the position for many years. 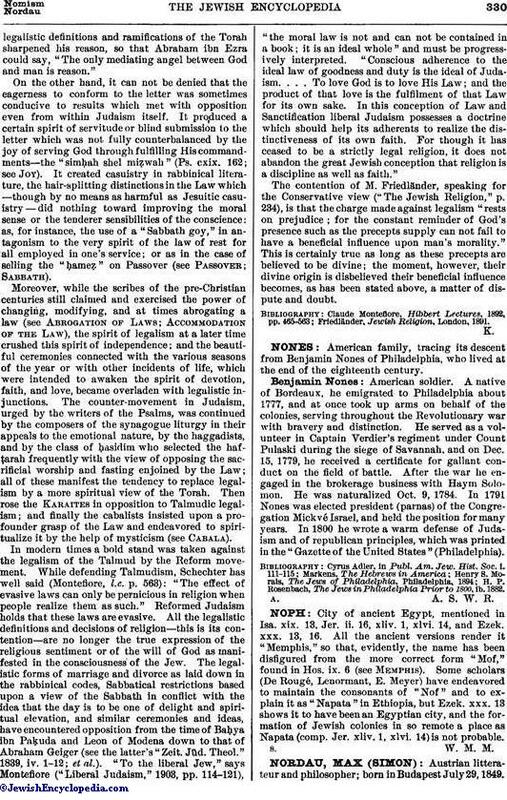 In 1800 he wrote a warm defense of Judaism and of republican principles, which was printed in the "Gazette of the United States" (Philadelphia). H. P. Rosenbach, The Jews in Philadelphia Prior to 1800, ib. 1882.